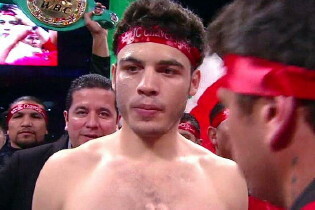 Chavez Jr. rehydrated up to 181lbs for his fight last Saturday night against Marco Antonio Rubio, and the weight advantage seemed to really help Chavez Jr. in this fight with his ability to dominate the lighter Rubio in close during much of the action. Chavez Jr. made the 160 pound weight limit at last Friday’s weigh-in but then put on 21.5 pounds after rehydrating and showed no signs of having taken on and put back on that massive amount of weight. That was a huge shift in weight and Chavez Jr. was able to do it without any problems. In his fight before the Rubio bout, Chavez Jr. weighed in at 179lbs against Peter Manfredo Jr. and the fight before that, Chavez Jr. came in at 185lbs against then WBC champion Sebastian Zbik. He’s always going to be in the neighborhood of 180 it seems, and that would be very tough for smaller guys like Margarito or Cotto, who both top out at a little over 160. Both would make it interesting for a while against Chavez Jr. but with a 20 pound weight advantage going for him, it would put Chavez Jr. in an enviable position to do whatever he wanted in the ring. A fight between Cotto and Chavez Jr. might prove difficult, if not impossible, to put together due to Cotto wanting a catchweight. He’s not going to ever agree to fight Chavez Jr. at 160 knowing that he’ll rehydrate up to 180 and come into the ring with a 20 pound weight advantage. Cotto is probably going to want Chavez Jr. to meet him at least 157 at the very least. Would Chavez Jr. agree to do that? I don’t think he will. With the money that Chavez Jr. makes in fighting the contenders that Arum lines up for him, he doesn’t need to go through the troubles of having to shift an additional three rounds of weight. I think Chavez Jr. could obviously do this and still rehydrate up to 180+, since his body seems to be able to respond well to draining and rehydrating but I think it would come down to maybe an ego thing where he might not want to budge from 160 and might want Cotto to come all the way up.